What a fun book this is! Part action-adventure and mystery-game, this first book in The 39 Clues series sets the stage for what I thought was a kid’s version of an Indiana Jones-type race. When 11 year-old Dan and 14 year-old Amy Cahill attend their grandmother’s funeral and subsequent reading of her will, they are given the choice of inheriting one million dollars each or taking the first of 39 Clues in a quest leading to a secret that will make them the most powerful and influential human beings on the planet. However, other select relatives are also given the first Clue, and with only one winner of the treasure, a deadly competition begins. I loved the main characters! Amy, an avid bibliophile, gets shy around crowds and prefers being alone, while Dan is exceptional in solving math problems and loves to collect things. They have a typical brother and sister relationship but they are close and look out for each other because they are orphans. The reader easily cheers for them and follows them on their adventures where we get to see them use their skills and overcome their fears as they evade the other relatives who are all fighting to find the second clue and will stop at nothing to get it. The book ends on a suspenseful note when they find the second Clue, and we are left with questions as to who really are the good and bad guys. This book is a fast read with some comical scenes (I could see it made into a Walt Disney movie one day). Readers will also discover interesting historical tidbits along the way. 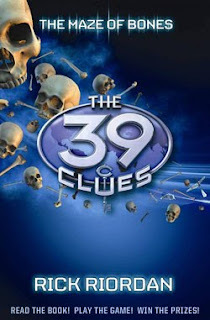 What’s more, readers can also play the game and win prizes online, since the book comes with 6 cards with codes to enter on the official Web site http://www.the39clues.com/. So the reader can enter the race, explore the Cahill world and track down clues. I actually went on the site and created an account to see what it was all about. Rick Riordan and Scholastic have created an interesting reading and playing experience with this book series. I can’t wait to read the next one. This series is on my list for 2010! This sounds way interesting and now really want to read!